According to statistics of consumer associations nationwide (excluding Hong Kong, Macao and Taiwan), all together 619,415 cases of consumer complaints were settled in 2014, of which, 543,970 cases were closed, accounting for 87.82% of the total cases and redeeming economic losses of RMB 920.02 million for consumers. 7,299 cases were double compensated for fraudulent conducts of business operators, and the double compensations amounted to RMB 15 million. Throughout the year, consumer associations of all levels supported 1,462 cases of consumer complaints and received 920,000 visiting and consulting consumers. 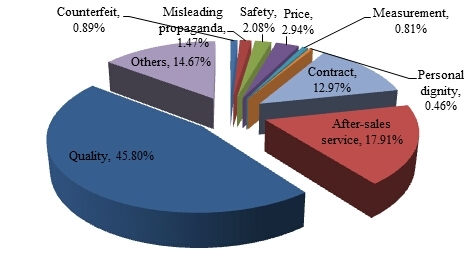 According to the classification of complaints (as shown in Chart 1), 45.80% of the complaints submitted were about quality, 17.91% were about after-sales service, 12.97% about contract, 2.94% about price, 2.08% about safety, 1.47% about misleading propaganda, 0.89% about counterfeit, 0.81% about measurement, 0.46% about personal dignity, and 14.67% about others. Issues in product quality, after-sale service and contract remain the primary causes for complaints, accounting for more than 70% of the total complaints. Compared with that of 2013 (as shown in Table 1), the proportion of complaints about quality, after-sales service, safety and personal dignity increased to some extent while complaints about others decreased somewhat. The number of complaints about quality declined, but its proportion increased to some extent. 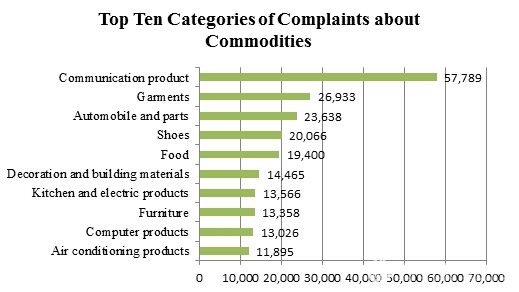 Compared with that of 2013 (as shown in Chart 2 and Table 2), the complaints about household appliances and electronic products, apparel, footwear and headwear, household goods, transportation means and food still rank top on the list of complaints about commodities. The proportion of complaints about clothing (category of apparel, footwear and headwear), food (food category) and shelter (category of household building materials) went down to some extent. Only the proportion of transportation (category of transportation means) saw a slight increase. 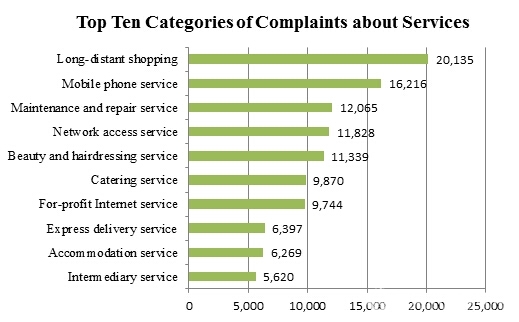 According to data about service complaints in 2014 (as shown in Chart 3 and Table 3), complaints about life and social service, Internet service, sales service, telecommunication service and postal service ranked among the top five categories of complaints. Compared with that of 2013, complaints about Internet service rose from the fourth to the second while complaints about postal services ranked the fifth on the list of complaints about services in 2014, and have become the focus of consumer complaints. 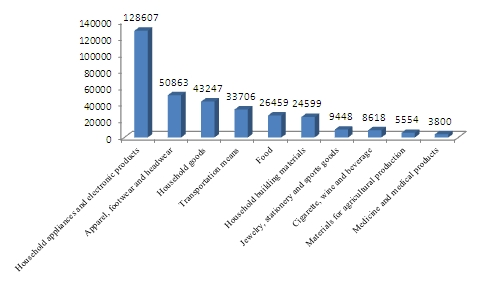 In specific complaints about commodities, the leading categories are (as shown in Chart 4): communication products, garments, automobile and parts, shoes and food. Complaints about food dropped from the second in 2013 to the fifth in 2014, indicating that the food consumption environment has been further improved thanks to the concerted efforts of multiple parties, including government authorities, industry organizations, consumer organizations, food operators, consumers and news media. The number of complaints about automobile and parts rose from the fourth in 2013 to the third in 2014. The newly revised Law on Protection of Consumer Rights and Interests was officially delivered on March 15, 2014, in which the clause on reversion of burden of proof for durables like cars can more effectively help consumers claim rights. The enforcement of this law coupled with the implementation of the Provisions on Repairing, Replacing and Returning Liabilities of Family Cars have enhanced the right-protection awareness of consumers of vehicle products and guaranteed their rights, which can be directly reflected by the increasing proportion of complaints in this regard. 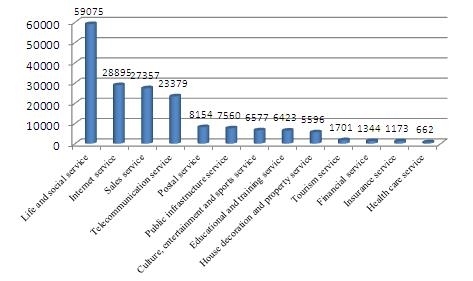 Among all complaints about services, the leading categories complained are (as shown in Chart 5): long-distant shopping, mobile phone service, maintenance and repair service, network access service, beauty and hairdressing service. The number of complaints about long-distant shopping with online shopping as the main part is far ahead of complaints about other services, and the main cause for the rising number of such complaints is the surging number of online shopping. Moreover, the implementation of regulations of the newly revised Law on Protection of Consumer Rights and Interests on long-distant shopping, such as returning goods within seven days after receipt without giving a reason, have provided legal basis for safeguarding consumers’ legitimate rights and interests. (a) Increasingly diversified hotspot complaints and remarkably increased group complaints. Looking at the analysis of complaints settled by consumer associations over the years, we can find that the hotspot consumer complaints before 2008 were mainly concentrated on commonly used household goods like household appliances and electronic products, articles of daily use and food. Hotspot consumer complaints have become diversified with the transformation of Chinese residents’ consumption characteristics from similar and waved consumption to personalized consumption in recent years. The hotspot consumer complaints settled by consumer associations in 2014 showcase that the complaints with an upward trend were mainly about automobile, commercial house, counterfeit agricultural products, online shopping, decoration material, consumers’ personal information disclosure, tourism service, prepaid shopping and express delivery service. Besides, previous consumer complaints were mainly about product quality, but now the natures of complaints typically involve safety, price, measurement, counterfeit, contract, misleading propaganda, personal dignity, among other aspects. The complaints about commodities and services are characterized by multiple categories and complex natures. With the popularization of the Internet, especially the mobile Internet, there are more channels and ways for consumers to communicate. After the implementation of the newly revised Law on Protection of Consumer Rights and Interests, group complaints of consumers have begun to rise remarkably. Here is a case in point. On March 6, 2014, Guizhou Provincial Consumers’ Association received a group complaint about the long-time irregular water supply involving tens of thousands of residents of the city. According to their reflections, their community had suffered irregular water supply since the end of October 2013. Water was supplied only at night, which lasted for quite a long time and had caused great inconvenience to the life of local residents. 14 representatives of the community submitted their complaints with their fingerprints on and earnestly requested the association to help address the issue. After receiving the complaint, the provincial consumers’ association immediately sent specially-assigned personnel to the community and the water supply company to get the picture. The investigation showed that the affected community had begun to report the issue respectively to the water supply company, 12319 public service platform and the media since November 2013, but the issue had been protracted and not been solved, which had the risk of causing mass disturbance. This complaint affected so many residents for such a long time in a deep and complex manner. In order to thoroughly resolve the issue for local residents, the provincial consumers’ association reported its investigations and handling suggestions to Guiyang Municipal Party Committee and Municipal Government. The Municipal Government of Guiyang convened a special meeting with the participation of officials of different departments including the provincial consumers’ association, the municipal bureau for urban planning and the municipal power supply company. The meeting concluded with nine opinions that were issued and implemented by Guiyang Municipal Government according to the meeting’s minute. In the end, this issue about domestic water supply was addressed under the common efforts of related departments. Under the influence of consumption upgrade and changes of consumption mode, long-distant (including online, TV, telephone and mail) shopping and prepaid consumption have become two popular consumption patterns requiring higher credit. However, domestic credit system building is not yet perfect, the information communication mechanism is blocked, and business operators’ credit consciousness needs to be further strengthened. In this context, it’s easy to generate consumer disputes and result in more complaints. In 2014, consumer associations nationwide settled 20,135 cases of complaints about long-distant shopping, of which, 92.28% were complaints about online shopping. Prominent consumer complaints about online shopping were mainly reflected in: first, unclear trading object and difficult protection of right to know; second, misleading propaganda of consumption; third, infringement upon consumers’ personal information; fourth, existence of security risks in online shopping payment; fifth, occasional occurrence of dissatisfactory after-sales service, difficult return of goods and delay in delivery. The complaints of consumers about prepaid consumption principally include the following aspects. First, the commitment made when issuing a consumer card is not fulfilled. Many operators make all kinds of commitments in sales to persuade consumers to buy consumer cards, but they fail to honor their service commitments afterwards. This can be mainly manifested in: “shrinking” service, lowered service quality or limited reduction of consumption scope. They raise price with all kinds of excuses, making consumers pay more money by using consumer cards than paying by cash. They forcibly sell other commodities or services to consumers in their serving process and deduct the payment from the card. Second, consumer card issuing shops might change their addresses and even shut down their stores. After applying the prepaid card for consumption, some card issuing stores have suddenly shut down or some management main bodies have changed, making consumers’ prepaid cards no longer usable and refundable. Third, some sellers would evade responsibilities for breach of contract on the grounds of “once sold out, no return”. After buying consumer card, some consumers may find it difficult to return the card if they are dissatisfied with the service, or cannot enjoy the service due to objective reasons. Here is an example. A number of consumers reported to Tianjin Consumers’ Association that they bought the hairdressing card valued RMB 2,000 and RMB 500 at 50% off from a barbershop on Lijin Road, Dongli District of Tianjin. In this April, the working staff of the barbershop told them that the shop would be closed soon and asked them to use the balance of their cards in the store situated in Zhongshan Road of Hedong District. Some consumers argued that the two stores are far from each other and it’s inconvenient for them to go to the new store, so they requested to return the balance in their cards but were declined by the seller. Upon meditation, the seller returned the balance in the cards for these consumers. In 2014, consumer associations nationwide settled a total of 23,379 cases of complaints about telecommunication service, ranking fourth among the complaints about services. Telecommunication service involves all aspects of our daily life and works, and complaints about telecommunication service remains top on the list of all complaints as the telecommunication industry keeps developing. From the perspective of consumer complaints, we can find that the principal issues in the field of telecommunication service include the following aspects. First, the comprehensive service quality needs to be improved. The comprehensive service quality includes telecommunication service hardware and software, namely telecommunication facility and network signal quality and telecom staff’s service level. The complaints daily settled by consumer associations involve more issues about the lack of service windows of telecom business offices, low inefficiency in handling affairs, fewer service staff, slow response to complaints, weak mobile signal, easily lost connection and existence of dead zone in network coverage. Second, consumers are dissatisfied with the charging rate and advertising easily makes consumers misunderstand. Consumers reflected that telecommunication enterprises have a low rate of transparency and fail to fulfill their obligations to prompt consumers about restrictive conditions of their charging plan and other matters needing attention of consumers. Third, unfair standard terms have infringed upon consumers’ rights and interests. Consumer complaints are concentrated in the operators’ requirement for minimum charge and the binding of fixed-line and broadband. After one subscribed service arrears, another service would be suspended. The data plan and talk time cannot be added up. For instance, Henan Provincial Consumers’ Association united a number of news units to gather information about issues existing in consumption field, such as unfair clauses. The association received a large number of complaints about telecom operators’ clauses on mobile phone traffic, such as “users cannot carry forward unused monthly data allowance” and “excess consumption”. The three major telecom carriers communicated with the provincial consumers’ association for many times, and finally China Mobile Henan Branch extended the data use time to 3 months to half a year. Consumers’ data plan is changed to data clearance once a quarter or once half a year. On December 24, 2014, consumer Mr. Guo submitted a complaint to Gansu Provincial Consumers’ Association. He claimed that he bought a contract mobile phone from a network e-shop at the price of RMB 2,199. After signing the contract, he learned through the customer service that the phone number was bound with other services that were mutually exclusive with the contract plan of the order, so he couldn’t enjoy the benefits of this activity and the call charge return. Mr. Guo requested the return of the phone, but he was told that the phone was opened that would affect its secondary sales and thus could not be returned. Mr. Guo believed that what he bought was a contract phone and the operator failed to inform him accurately and misled him by its package that had harmed his rights and interests. After an unsuccessful communication with the customer service, he requested the provincial consumers’ association to step in. Upon the mediation of the association, the operator accepted the return request, and Mr. Guo was satisfied with it. (d) Difficult to protect rights in house-related consumption. In 2014, consumer associations nationwide settled altogether 24,599 cases of complaints about house and building materials and 1,069 cases were about housing intermediary service. Causes for housing complaints are complex and group complaints in most occasions. Housing-related complaints are mainly concentrated in the following aspects. First, it’s about house quality, typically including water leakage, water seepage, peeling of external wall surface, wall crack and irrational layout for air conditioner. Second, it’s about trading contract, principally including additional clause to contract, inconsistency between property under construction and ready property, different surrounding environment, imperfect surroundings, delayed delivery and down payment-related disputes. Third, it’s about fraudulence in floor space, chiefly including a big difference between the actual floor space and the delivery area and different understandings of policies and regulations by both parties. Fourth, it’s about property service, mainly including the frequent occurrence of shirking phenomenon between the property management company and the developer when determining who should be the responsible for the house quality. Fifth, it’s about housing intermediary disputes, mainly including issues related to the actual years and specific areas of a second-hand house, the number of people requiring registered residence in the transferring process of a second-hand house, unpaid property fees, and buck passing by the intermediary agent. For example, consumer An bought a commercial house at the price of RMB 380,000 from a real estate company in Minhe County, Haidong City of Qinghai Province on February 12, 2013. According to the contract, the house should be delivered for use on May 1, 2014, and the developer should pay RMB 20,000 as penalty for not delivering the house on time. But the house was still not delivered on August 15, 2014. On August 21, 2014, the buyer submitted a complaint to the consumers’ association of Minhe County, Haidong City of Qinghai Province and claimed for RMB 20,000 compensations. After receiving the complaint, the working staff of the association went to the real estate company for investigation and pointed out that the developer should bear the liability for breach of contract because it failed to perform the contract and tell the buyer about the delay of delivery. After mediation, both parties involved reached an agreement on a compensation of RMB 16,000. With the increase of the vehicle population, complaints about auto after-sales and maintenance services have also risen year by year. In 2014, consumer associations nationwide settled a total of 26,251 cases of complaints about vehicles, of which, 10,230 cases were about quality, 6,104 about contract while 4,111 about after-sales service. According to the statistical results of annual complaints and the survey report on consumers’ satisfaction degree of Shandong, Heilongjiang and other provinces, consumers’ complaints about car sales and maintenance services included: compulsory consumption, unfair standard form of contract terms, quality, service charge and after-sales service. First, the compulsory consumption was mainly concentrated in compulsory subscription of insurance, forced buying of agency service for car registration, raising sales price, concealing real information about mortgaging the license and selling the car. Consumers especially complained the improper marketing mode in car sales process. Second, the unfair standard form of contract terms was mainly concentrated in no written contract on car procurement, too simple contract terms, or taking back the contract after picking up the car, and the mixture use of down payments and deposits had caused unequal rights of both parties involved. Third, it’s about quality problem. In 2014, a car manufacturer’s rear overhang of beam broke repeatedly. Consumer associations of different areas had received consumers’ reflections on the beam crack and potential risks. However, the proposed remedy options were not satisfied consumers. Fourth, the service cost-related issues mainly included no clear expression and transparency of repair and maintenance price, only replacement but no repair of spare parts, excessive maintenance, failure to address issues at one time, and lower technological level of maintenance personnel. Fifth, it’s tough and uncivilized after-sales service attitude that had escalated the contradictions. When a car owner consulted or complained about the quality and after-sales services, the working staff could not positively give technological explanations and could not correctly face the objective fact of car failure, and usually avoided responsibilities on the grounds of “human factor” or proposed unnecessary “test”. This had added consumers’ obligations of citing evidences. Car owner could not accept unreasonable, uncivilized and tough handling mode that had escalated the contradictions. For example, on May 27, 2014, the consumer rights and interests protection committee of Tong’an District, Xiamen City of Fujian Province received a complaint from Mr. Zheng. Mr. Zheng bought a car from a 4S store in Xiamen on May 24. When he was about to make the payment, he was told that comprehensive service fees would be charged separately, including bank risk guarantee fee, agency fee, “three guarantees” data transmission fee that are RMB 4,000 in total. Mr. Zheng argued that he was not told in advance, and believed that the practices of the store was irrational, so he required the store to charge no comprehensive fees, or return the down payment to him. After receiving Mr. Zheng’s complaint, the consumer’s rights and interests protection committee settled the case and conducted an investigation in accordance with the law. Under the mediation of the working staff of the consumers’ association, the store agreed to return the down payment to Mr. Zheng and Mr. Zheng was satisfied with the result. In 2014, consumer associations nationwide settled altogether 1,701 cases of complaints directly involving tourist services. The number of complains remained high if the complaints about accommodation, catering and other services indirectly involving tourism were accounted in. Consumer complaints related to tourism mainly include four aspects. First, the travel contract is nontransparent. Travel agencies usually obscure the contents like traveling route, time schedule, communication media and level, accommodation arrangement and hotel level, scenic spots (attractions) and tour routes when signing The Travel Contract with tourists. So, when a consumer dispute occurs, the explanations of the involved travel agency would go against consumers’ interests. Second, there are more disputes about tourism shopping. In the shopping activities arranged by travel agencies or in tourist attractions, many products are shoddy but sold at falsely high prices, and there are no hygiene licenses sometimes, especially for some gems, jade articles, pearls, crystal, medicine, health products and arts and crafts. Some travel agencies even violate regulations in arranging shopping in stores that lure or force consumers into consumption and sell goods of inferior quality at higher price. Third, there are more cases of fraudulence in tourism. Some travel agencies often arrange some self-paying projects for some domestic hot tourist routes and some are at key tourist attractions. This is a main way for travel agencies to seek benefits through “taking commissions on sales of tickets”, so consumers would be treated in consumption without knowing it. Fourth, it’s difficult to protect rights in purchasing by agents when travelling overseas. Sometimes, outbound travelers would entrust tour guides or other people to buy something. But, purchasing by agents involve many links, so when they come back to China and find that the commodity they bought is too pricy or poor in quality, it would waste time and energy to ask the tour guide to assist in repairing, returning and replacing the commodity. At the same time, some tour guides may act as shopping agents to recommend tourists to buy things of inferior quality at higher price. For example, Beijing consumer Ms. Wen reflected to a consumers’ association that her families took part in a tour organized by a travel agency to Hong Kong, during which the tour guide took them to buy jewelries. As recommended by the salesperson and the tour guide, they bought some jewelry and paid it with all the cash, and the tour guide actively helped the payment process. But after coming back to Beijing, Ms. Wen found that the jewelry was poor in quality and the price was obviously too high. She also questioned about the change of payment from cash to bank card. Therefore, Ms. Wen negotiated with the store in Hong Kong about the return of the jewelry. But the store said that the jewelry was paid by bank card of the tour guide, so the payment could only be returned to the tour guide’s bank card. Ms. Wen called the tour guide. She was told to send the jewelry to him first, and he would return the jewelry when he takes another tour group to Hong Kong and then transfer the payment to Ms. Wen after he got the payment in his bank card. Ms. Wen search on the Internet and found that many tourists had complained about the shopping tours led by this tour guide, so she did not trust his oral promise and asked him to give a written promise, but the guide refused. (g) Difficult confirmation of compensations for health consumption, and still serious misleading in sales of health products to old consumers. In recent years, complaints about medicine, medical products and health care services have always been a focus of consumer complaints. In 2014, consumer associations nationwide settled a total of 3,800 cases of complaints about medicines and medical products and 662 cases of complaints about health care service. Most complaints were about quality, misleading propaganda and after-sales service. When it comes to some complaints about health care products bought on the Internet, television and telephone, it’s difficult for consumers to get compensations for their losses since the location of sellers cannot be confirmed and there are no third-party platforms regulating clear responsibilities for compensation. After the enforcement of the newly revised Law on Protection of Consumer Rights and Interests, more efforts have been made to protect consumers’ rights and interests and the third-party responsibilities have been determined, which have increased the proportion of solved complaints about medicine and health care products. The characteristics of complaints about medicine, medical products and health care products include the following aspects. First, it’s the concentrated consumer groups. Data about complaints showcase that 90% of these consumers are old people who lack basic knowledge and judgment of the concept and effects of health care products. In the meantime, health care product operators have clearly seen through the elder desiring health and mislead them by false publicity of the effect to buy health products with common functions at higher price. Second, the channel for obtaining health product information is complex. Consumers typically learn about health product information from television, newspaper, radio and the Internet. Overwhelming and long-time rolling advertisements “brainwash” consumers unconsciously and strengthen consumers’ cognition of the products. Third, the means of promotion of health care products is diversified. The most common means for operators to promote their products includes “providing free medicine”, “free prize draw for trial”, “consultation with famous doctor”, “free tour” and “experts lecture”. They even go for “shills” for advertising and lure the elder to their tricks. For example, in May 2014, Hubei Consumers’ Association transferred the complaints of a consumer to Shaanxi Consumers’ Association. According to the complaint, on December 10, 2013, the consumer saw a TV program advertising that the consumer’s illness could be cured and was lured by the seller to spend RMB 80,400 on its products. But, the illness was not cured. So the consumer requested the compensation. The investigation of the working staff of Shaanxi Consumers’ Association showed that the product bought by the consumer was not medicine but health care product. Based on the provisions of Article 45 of the Consumer Protection Law, the provincial consumers’ association contacted the TV station involved and asked it to settle the complaint case. After many times of communications, the retailer finally returned RMB 68,100 to the consumer and the consumer was satisfied with the result.